Today I received a quote request from a new source, a translation company with which I had never worked before. They asked availability and rates for an urgent legal translation project. 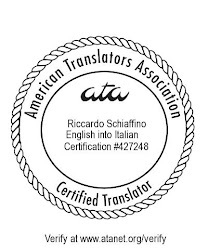 Together with their message they sent (not only to me, but to an unspecified number of English to Italian translators) a file with the source documents. When I opened the files, I found a couple of very confidential documents, with the kind of information that, if I were the original customer, I would assume would be treated with the utmost caution by the agency. At a minimum, this agency should have sent a message indicating the type of document to translate (e.g. "police records, about 1200 words"), and also that, before they could send it out to prospective translators, they needed to have a confidentiality agreement signed. Sending confidential and sensitive documents to all and sundry, as they did, is a clear and serious breach of confidentiality. I couldn't agree more. The end customer has the right to have his or her documents treated with the utmost respect and confidentiality. Unfortunately, many end clients might not even be aware of the fact that agencies outsource to third parties, although I hope that's clearly specified in the contract. Confidentiality is key, and we must go to great lengths to ensure it. On behalf of our company, I can say we have various ways to deal with this issue - document encryption on server, signed confidentiality agreements, everything is stated in general terms and conditions for customers. An obvious reason to deal solely with very small agencies, or, better still, freelance translators alone. Well, thanks for this guide. I think I really should check it first before doing a translation projects. Keep posting.